The abundant snowfall rather threw a spanner in our plans to prepare the track for welding on Monday, weld on Tuesday, and have the massive Mega-Clippathon on Wednesday. None of this happened. It's not that we are afraid of snow, but it was so white we couldn't see the track. How to lay out plastics and clips if you can't see where they were laid before? We are not defeated, we have simply regrouped. The preparation day was today, welding will take place tomorrow with a mini Clippathon (5 volunteers so far) immediately afterwards, and a medium Clippathon will now take place on Friday, with a gang of PWayers. There will not be a mess coach, so look after yourself and bring what you need. Still no blogger's camera, but it's on order. Its timely delivery is another victim of the snowfall. With a bit of luck it should be in service on Friday. 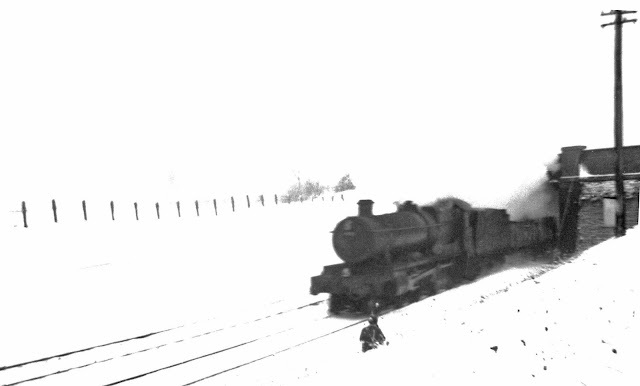 In the meantime, here are some photographs taken at Broadway (Springfield Lane end) by local resident Brian Parsons in January 1963 - remember the cold winter then? Well, it wasn't quite as cold as this, but you get the idea. You can see the rails, but not the track. This morning we car pooled it to Little Buckland, sharing with those volunteers who had something resembling a 4 wheel drive, as the access road was pretty churned up. All eyes were on the trackbed. The great melt had set in, but could we see that track? We could. Phew. as well as clipping up firmly another two lengths at the breather end, to make quite sure that the anchor is strong enough not to disturb it. With the cold weather the rail will need quite a bit of stretching. 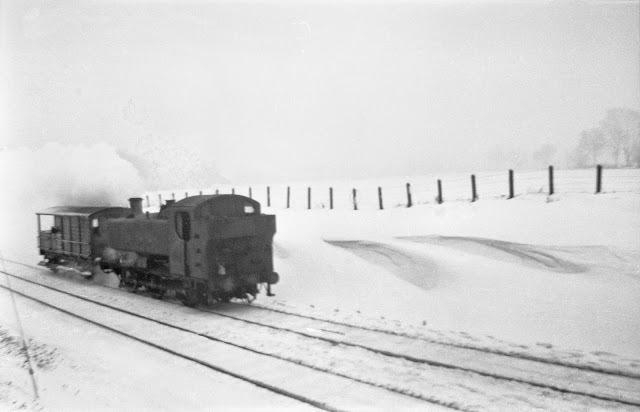 9471 on the down line with a Toad van, approaching Springfield Lane on 5th January 1963. Brian Parsons. The 1000m length is now fully ready for the stretching, welding and clipping up tomorrow. We will be assisting the welding team in the morning, and as soon as they have done one of the two pulls, we will start to clip it down so that it can no longer move once the ends are welded together. This picture nicely shows the snow drift that was building up in the cutting, with the rails actually covered in the middle distance. The loco with the down goods at Springfield Lane is 90448, a 2-8-0 Austerity that was based at Woodford Halse when the picture was taken. It was scrapped 3 years later by Drapers in Hull. In the afternoon we brought the red Transit up from Winchcombe loaded with more Pandrols and took these up to Broadway, where the rest of the gang arrived in a lashing rainstorm. This felt pretty grim. However, it was soon over, ceding its place to a large blue gap in the clouds which made the clipping up by the goods shed quite agreeable. We secured all the rail laid to date at 5 sleeper intervals, and fully clipped up one length, together with another one by the bridge that we detected as in need of completing. All in all it was a good practice session for tomorrow. Finally, here is also a sound recording, made in 1966, of a Black Five passing the goods shed. That was such a good location for watching trains. John Diston, George Bryant and Brian Parsons all stood there and watched the trains go by. Brian even had one of the first ever portable tape recorders, and this is how the recording of the Black Five was made. Is it unique? It probably is. Well done to the team that turned out today! Yes, I remember the winter of 1963; walking on the tops of fence posts to get to school (no such thing as going home because of the weather then. - Just keep your coats on! Even the free milk, remember that, was frozen!). 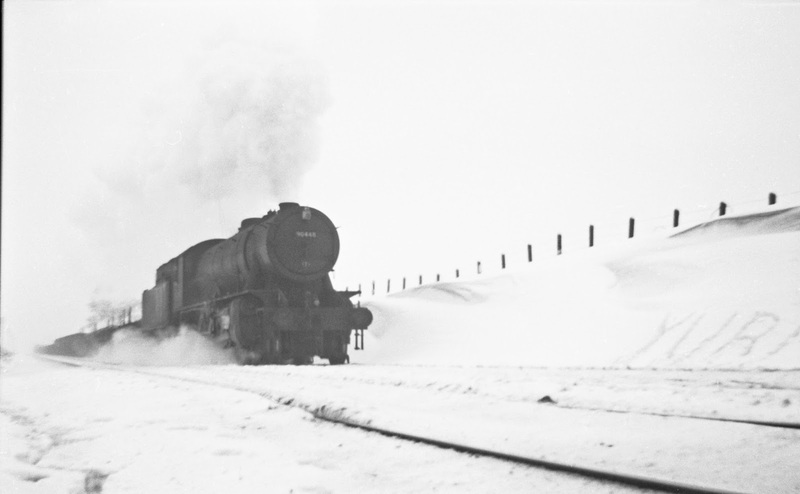 I have talked with drivers since and was told that frozen points were dealt with by the use of a steam lance from the front of an engine, or stand the engine over the points until they unfroze! The pictures you have put on are excellent. You really feel like you are there, (must turn the central heating up). Regards, Paul. As a rough idea on pull length. I estimate a pull of 310mm. Jo, Bravo Zulu (Navy Speak for Well Done)to you and your team. Nice photographs just how I remember winter turns to Gloucester. I fired 7908 several times as it was a Tyseley engine. I never got to work Tyseley's top mileage job though which this loco worked regularly. 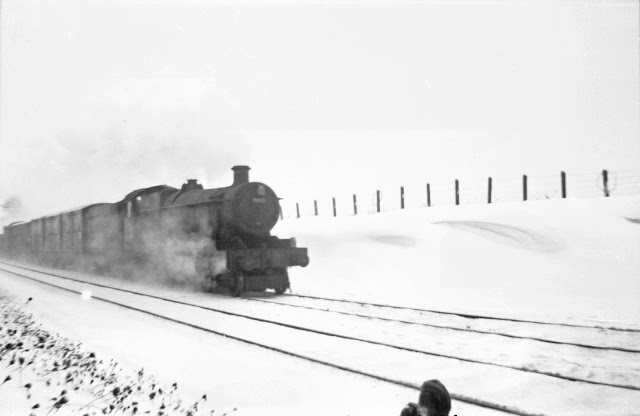 Snow Hill to Swindon via Gloucester and return via Oxford, Honeybourne and Stratford. Over 200 miles and very profitable. The WD's were boneshakers on a long trip you had to get your fillings checked after. All the best to you and your Army. Have a good Christmas. Rod in Italy. I was 13 years young when the 62-63 Big Freeze rolled into the UK.I remember it very well. The country did its best to grind to a halt. Well, we tried. Water supplies for declining steam sheds were especially affected. Everything that could freeze, froze. Even the Thames joined in. One hardy type drove across the ice. We reckoned the ice was 12" thick upstream. The birds did very badly and froze to death in trees by the thousands. You chaps are showing great spirit in choosing to turn out in adverse weather. Well done! Yes, I too vividly remember the terrible winter of 1963. Thanks for the memory. It didn't seem so terrible to young boys back then, but I do remember we had an extended Christmas holiday from school because their central heating pipes had frozen and then burst, and all the classrooms were flooded ! Term didn't resume until mid January, as I recall. We all thought it was great fun. And the country didn't grind to a complete halt. It beats me how you hope to get anything done this week, but I see the BBC is forecasting some sort of thaw, with rain replacing snow. Good luck. We are all rooting for you. No pictures but the reported words allows us to "see" what's going on. Well done Jo for the above, Yep, I remember the brig freeze back then waking up in the barrack block at Halton and scraping the ice off the inside of the windows!!! Oh happy days!!!! Today the world just goes to pot because of an inch of snow, (2.5 centimetres for the youngsters reading this )Well done to all who turned out, hopefully there will be a bumper bundle of piccies to see on the next report when the new camera arrives, and lets get a picture of the camera operator with the camera as well please. look forward to the next report as always. So, you were a Halton Apprentice eh? Trenchard's finest, so much so that so they foolishly binned the scheme by the 21st Century, just as civilian apprenticeships started to gain popularity. Toddington Ted. Someone wrote "YURI" in the snow.... Gagarin? Yuri Gagarin was the first human being into space, 18 months earlier. Maybe some fans of his, while waiting away the idle hours before a train came by in the snow?